Do you have to pass a hair drug test? Then you have come to the right place. First let us give you a few facts about the hair drug test. The hair drug test is the least common form of drug testing, this is probably due to the high cost of this type of drug test. To beat a hair drug test, can be quite difficult for some people. This depends on the toxins and their levels, that may be present in the hair follicle. Certain traces of substances are harder to remove from the hair than others. For example, oil based or oil soluble toxins seem to be easier to remove than water soluble ones. For example, if you have marijuana or benzodiazepines in your hair shaft, then with the use of a detox shampoo (like the ones listed below) you can pass a hair drug test. However, there are some problematic substances which are alot harder to remove and make it less likely to pass a hair drug test. The most problematic seem to be cocaine and methamphetamines. Although not impossible, it is hard to predict if you will indeed pass a hair drug test for those types of substances. There are however some products and techniques you can use to increase the odds of you passing a hair drug test. You can combine one of the detox shampoos with the Nexxus Aloe Rid shampoo in order to increase to effectiveness of the detox shampoos. To increase your odds of passing a hair drug test, you must wash your hair with the Nexxus Aloe Rid shampoo every day until the day of your hair drug test. Other substances besides cocaine or methamphetamines, dont seem to too problematic in preventing you from passing a hair drug test. 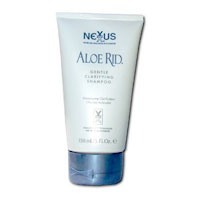 However, using the Nexxus Aloe Rid is still reccommended. Hair analysis not only detects if drugs of abuse have been used, it also provides information on the quantity and historic pattern of a person's drug use. This data is not available from any other drug testing procedure. Trace amounts of drug metabolites become entrapped in the core of the hair as it grows out from the body at a rate of approximately one-half inch per month. A lab analysis of the hair strand from any person will produce an accurate drug history for that person. It takes about 5 days for drugs to begin to appear in an individual's hair and will continue to be detectable in new hair for about 90 days. The Laboratory will usually test for the five most abused illicit drugs and drug catagories: Methamphetamines, Marijuana, Opiates, Cocaine, Phencyclidines (PCP). A standard screen with GC/MS confirmation requires at least 40 milligrams of hair or approximately 50-70 strands.